Coki Dive Center is a dive shop on Coki Beach, perhaps the best beach for snorkeling in St. Thomas, in the US Virgin Islands. It’s got a very chill vibe and doesn’t even have a door, so you can’t get to the shop except by walking up stairs from the beach, or by ducking under a wooden railing from the other side. 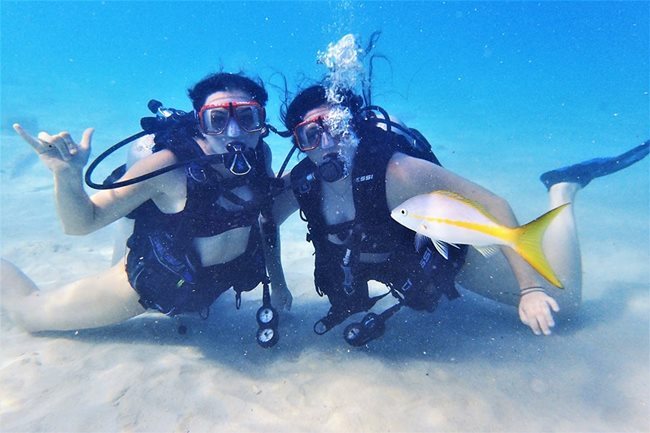 They rent snorkeling and scuba gear, teach scuba, and take visitors on scuba tours including night diving. They kindly allowed a press review of their scuba instruction, which takes place right on the beach. Learning to scuba dive is about as difficult as learning to drive. Through the PADI system of training, you must first go through book learning, watch a video, take a test, and then complete “confined water dives”, which are safe dives in a controlled swimming pool environment. 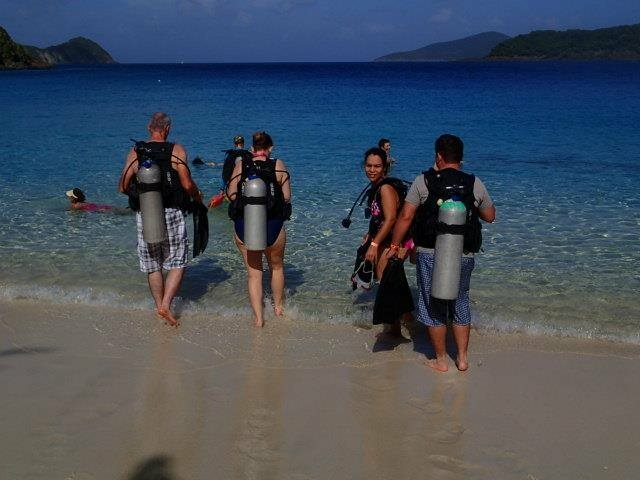 Then finally you get to experience the ocean, for “open water dives”, and become a certified scuba diver. 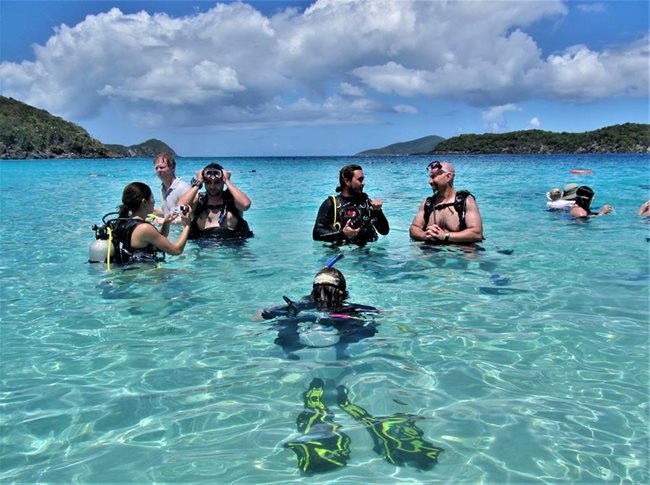 I took my confined water dive lessons back in New England, at Enfield Scuba (4.5 stars), before coming to the Virgin Islands. Only later did I realize that scuba diving off of a beach would count as a “confined dive”, because you can stand in the shallow beach water, even though it’s the open ocean. That would have burned more days of my vacation time, but also been far more pleasant than diving in a swimming pool with its chlorine water burning my eyes. My partner gave up on scuba diving partially because the chlorine was one step too much. My instructor was Britney, who was athletic but did not make me feel that I had to be macho. (And scuba diving looks great but does not require athletic prowess.) She was patient, explained the rules efficiently and clearly, and then we just had a good time together. Britney was high energy and made everything fun, taking my mind off of any anxiety of going under the water. Because we were diving from a beach, we just walked right in and then swam a few meters out as the water became gradually deeper. 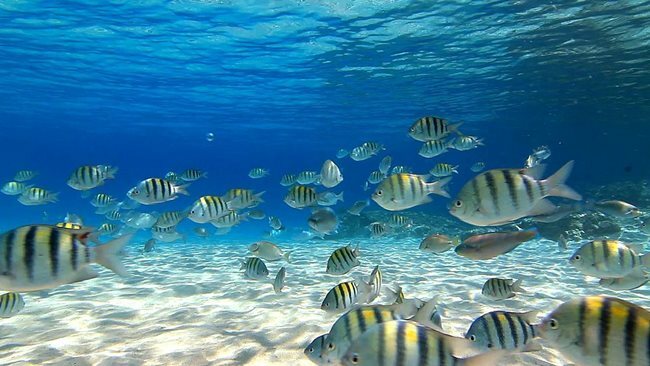 Remarkably, at Coki Beach, you’ll find schools of fish and coral so close to the shore. This is wonderfully convenient, so that you don’t need to take a boat way out for your dive. On our swim lesson, Britney pointed out two octopuses, well camouflaged, an eel, and exotic sea life like the arrow crab, which looked too much like a spider for me to want to hold it! Later, renting snorkeling gear, my guest and I saw a sea turtle and tons of fish life among the coral that’s an easy swim away from the beach. Pro tip: octopuses are often around rocks and they dump the shells of what they have eaten outside their lair. We saw so much for just a short trip! I felt safe with Britney, so frequently checked in with me with easy-to-learn hand signals. She gave me a dog bone, which caused the fish to flock to me. (Pro tip: you can get fish food at the Coki Dive Center for snorkeling, too.) My confined water dives had been too stressful and complicated to be much fun, so diving at Coki Beach was my first genuine scuba experience, and a very positive one. That was when I realized that all the effort to learn scuba was going to be worthwhile. Rentals for snorkeling and scuba are surprisingly inexpensive, too! Coki Beach itself is delightful just to relax. You can bring a blanket to sit under the sun or shade, but because of all the wild iguanas, it’s best to rent a beach chair instead. 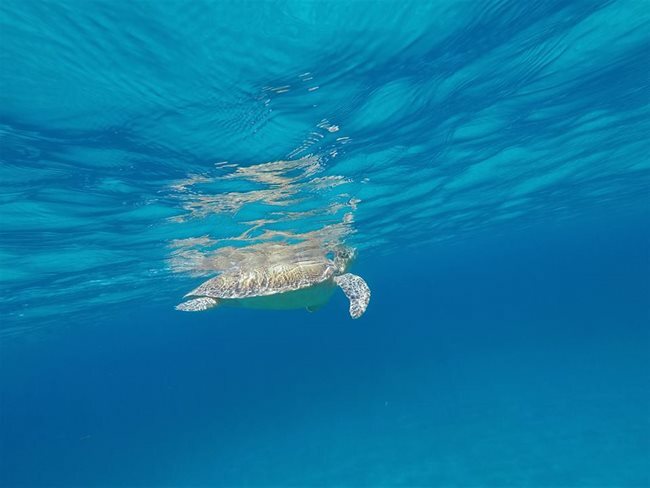 You’ll find several cute little shops there, and the only theme park in the US Virgin Islands, Coral World, where you can swim with a sea lion, swim with a sea turtle, and go “snuba” and “sea trek” diving, a simplified kind of scuba that anyone can do. The beach is a short walk from the Wyndham Margaritaville Vacation Club Resort. Pro tip: park at Margaritaville and eat their restaurant, and no one will mind if you leave your car there to walk over to Coki Dive. 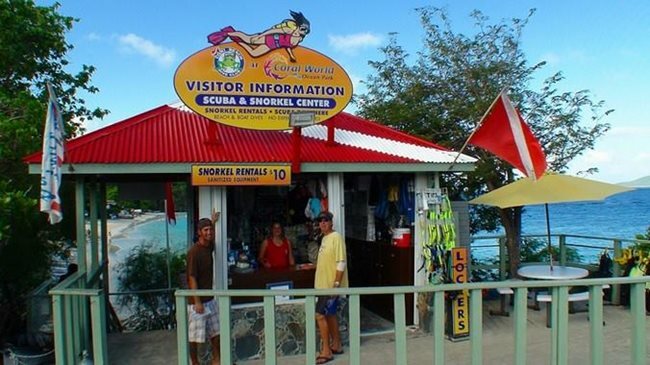 Coki Dive Center was a perfect experience at perhaps the best shoreline diving in St. Thomas. The dive shop is small, but welcoming and full of expertise and good cheer, and they had flippers in my giant foot size. I’m glad to give Coki Dive Center a full 5 stars.